Burglars are increasingly using keys to gain access to their victims’ homes, according to a new study by insurer LV=. Police statistics show a general decline in burglaries over the year, but the number where a key was used actually increased. More than 6,000 burglaries in 2014 were committed by using keys, rather than breaking into the property with force. The keys were either stolen at an earlier date, lost, or left hidden outside the home. 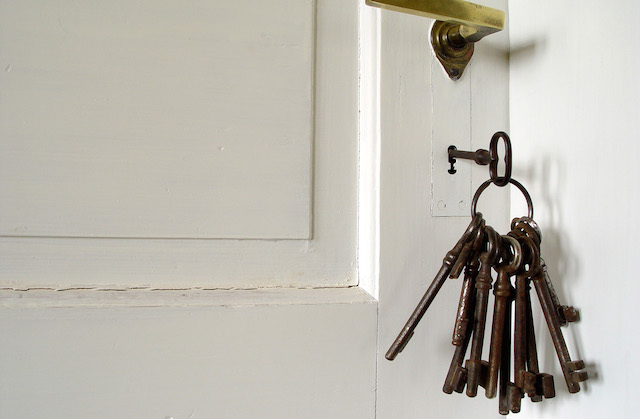 Almost a third of Britons say they leave a spare key hidden on their property. The most common places are under a plant pot (19%), bin (13%), rock or stone (13%), doormat (10%) or even under a gnome or garden ornament (8%). Those who left their key hidden said it was safe to do so because it’s only for short periods of time, because they believe they live in a safe area, or because they “have a really good hiding place”. Keys left outside the property are not the only target for burglars. Criminals can also gain easy access if a key is reachable through a letterbox or open window. Almost one fifth of people (18%) say they leave their keys close to the front door in plain sight, such as on a key hook, in a bowl or on a table. One in five (20%) even admit to leaving their front or back door unlocked while they’re out. Spare keys given to friends, family or people working in the home also pose a risk if they are lost or fall into the wrong hands. LV=’s research found that each household has lost track of at least two keys this way, meaning nearly 20 million house keys across the UK are unaccounted for. Most home insurance policies will not pay out if there is no sign of forced entry, so it’s very important to check the details of your policy before agreeing to lend out a spare key. LV= recommends homeowners avoid leaving their keys hidden on their property unless using a police approved key safe. It would be more accurate to say that insurance is invalidated if the claim is made on a day with a “Y” in it.